Thanks to Whole Foods Market’s generosity and the fierce loyalty of all of YOU who came out to shop! Our Community Support Day raised an amazing $25,575 – enough to provide meals at both cafes for all our students for the full year! We were so lucky to be selected by Whole Foods Market as part of their Food as an Economic Development Driver initiative for a 5% day on January 11th as they invest in organizations, projects and programs that leverage food to drive economic growth and prosperity through employment/job or skills training, business incubators, agriculture and manufacturing, public policy and other efforts. Curt’s Cafe was the only organization considered for our North Suburban metropolitan area because our program so perfectly fit the category! To date, Whole Foods Market has donated more than $13 million to local communities in the Midwest region from these 5% days alone. Thank you to Whole Foods Market and to all of you who provide ongoing support for the ongoing needs of our youth! Another Trunk show feature! Kendra Scott is a jewelry designer and philanthropist. She created a brand and culture that authentically values giving back and making a positive difference in the community. We are excited to be hosting a wonderful Trunk Show with a variety of vendors, at Curt’s on May 2nd. 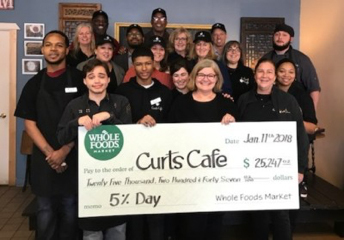 A portion of the sales will benefit Curt’s Cafes. There are two different shopping times. Noon to 4pm and again from 6pm to 8pm. Bees Knees Paper Goods is one of vendors who will be at the show! Bees Knees is a vintage inspired stationery and paper goods business. Here are some examples of these wonderful products! We are excited about our upcoming Trunk Show on May 2nd at Curt’s Cafe North. Shopping times are 12-4pm and 6 to 8pm <3 One of the vendors is an ambassador of India Hicks line. The India Hicks company is a brand made up of remarkable women who are entreprenuers. Support Curt’s Cafe by shopping at our online auction – Begins March 15th! POP-UP FOR GOOD @ CENTRAL PIZZA PIE – MARCH 10! We think these folks have a great product.